We have already seen how to define an email alias for a user. In this post we&apos;ll analyse some aspects to bear in mind when a user is substituted through assigning him/her an email alias. What can the substitute do? Each time that a task is assigned to the main user, the substitute user will be notified that a new task has been assigned to him/her. Additionally, the substitute user will be able to complete the task through his/her email, by clicking on any of the decisions that have been set for the actual task. 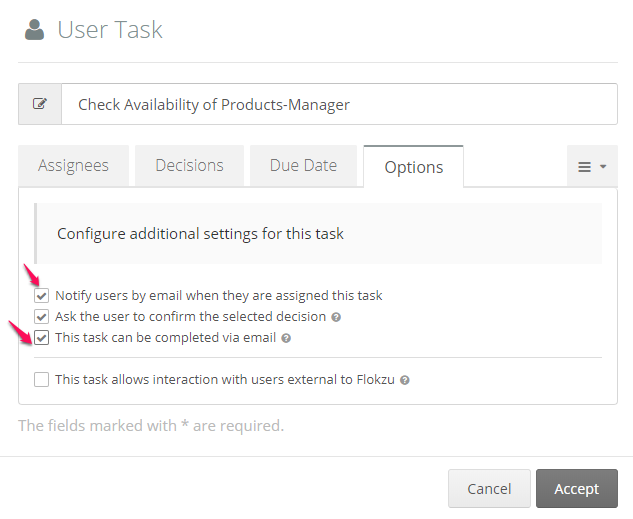 Keep in mind that the substitute user will receive notifications of task assigned and notifications to complete tasks through email as long as these features are enabled. How can notifications be enabled? What can&apos;t the substitute do? The substitute won&apos;t have access to Flokzu and for that same reason he/she won&apos;t have access to the main user&apos;s account. The susbtitute won&apos;t have access either to the reports nor any other permissions that had been given to the main user, with the exception of reding and assignation permissions for all those tasks in which the main user was participating in. What happens if the email alias is disabled? If after a time the main user comes back and disables the email alias, then all notifications will be sent again to the main user, so the substitute user won&apos;t receive assignation notifications anymoreentonces las notificaciones volverán a enviarse al suplido y el suplente ya no recibirá notificaciones de asignación de una tarea ni tendrá permiso para completarla a través de su correo electrónico.